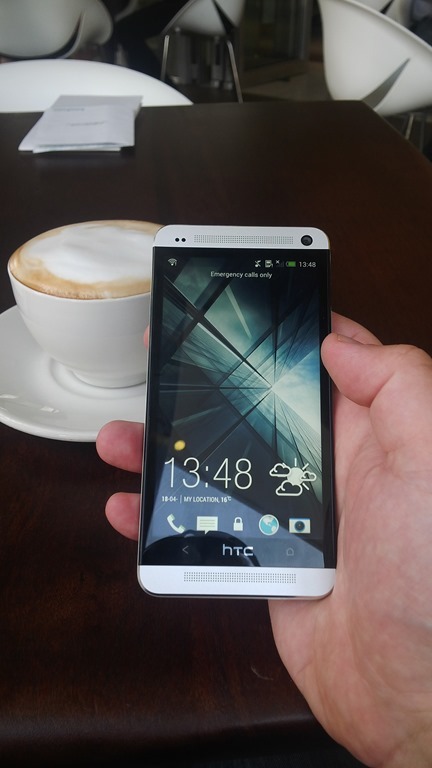 In March 2013 I attended the launch of the HTC One in Johannesburg, South Africa. What I saw that day was an impressive device that I couldn’t wait to get my hands on and use it in the real world. So when I got the chance to review the device I immediately jumped at the opportunity – and I am glad I did ! The HTC One is a head-turning device. Whenever I pulled it out of my pocket immediately people asked to see it. The HTC One feels solid and so well made with no “plastic-y” feel to it whatsoever. It fee likes a real phone. On the front you immediately notice two speakers situated at the top and bottom of the 4.7 inch, Full HD 1080p, 468 PPI display. 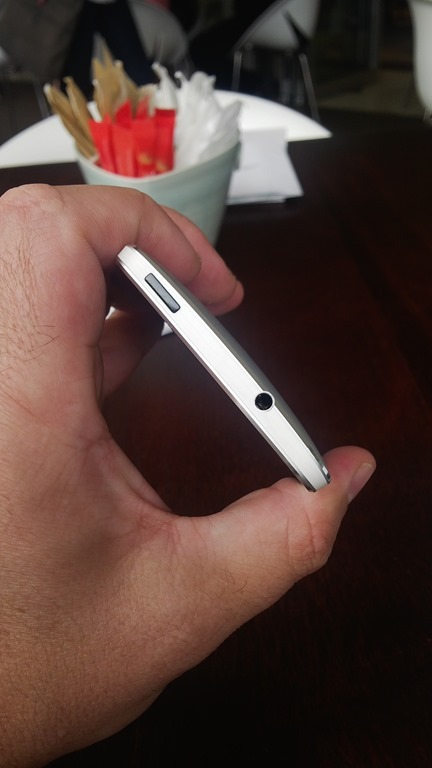 There are volume buttons on the right which are built into the slightly curved bezel edge. 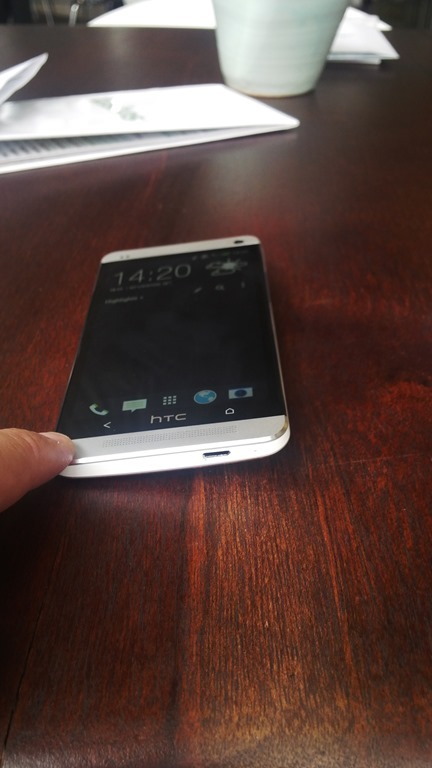 The power button is situated at the top of the HTC One however I did struggle with it. I feel like it is recessed too much into the frame and was a mission to use. Also being left-handed didn’t help matters and had to pay full attention to locate the button. Eventually I got used to it though. The back of the HTC is curvy. Too curvy for my liking. Whilst this makes it very comfortable to hold, I found that the curve was a bit much when I had the phone on the table and tried to type or navigate around the phone. 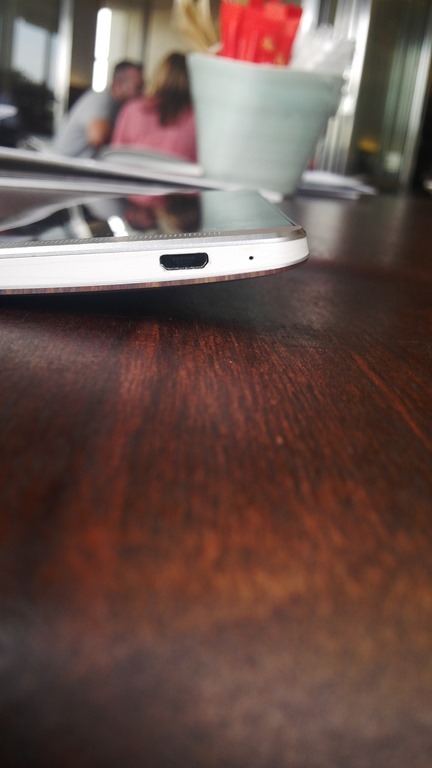 The curve made the phone “wobble” as I pushed on any app or icon that was on the side of the device. That being said, the quality of the HTC can not be beat. It is classy high-end-ultra-modern-shick that looks stunning. Initially I liked the Blinkfeed but after the wow-ness wore off it was just not for me. There is no way to switch if off or remove it which I find surprising for a high-end phone of this standard. The news-tiles are just quirky. Some are big tiles and some are small and there is no way to change them. My main problem was that it pulled all the info from my Facebook friends including pics and this was mixed in and amongst the news-sources stories mixed with my Tweets. But the worst part was that I found no way to control what was coming through. This leads to embarrassing moments when one of your mates on Facebook posts a not-so-kosher picture which is displayed right inside your Blinkfeed. Try explain that one when you are showing gran your new phone. I even had to ban my kids from playing with it as I was just not sure what will be pushed to me. I loved this Flipboard meets BlinkFeed feature. I just wish we had more control of the tiles and how / what we see come through. At the moment, its all or nothing. All of Facebook or none of it. All the dodgy images or none. I hope with a new software version we might get more of a say in this as the concept is superb. Now this is where the HTC One rocks – pun fully intended. Two awesome speakers that face the front which is typically where you are when you look at any multi-media such as video clips. 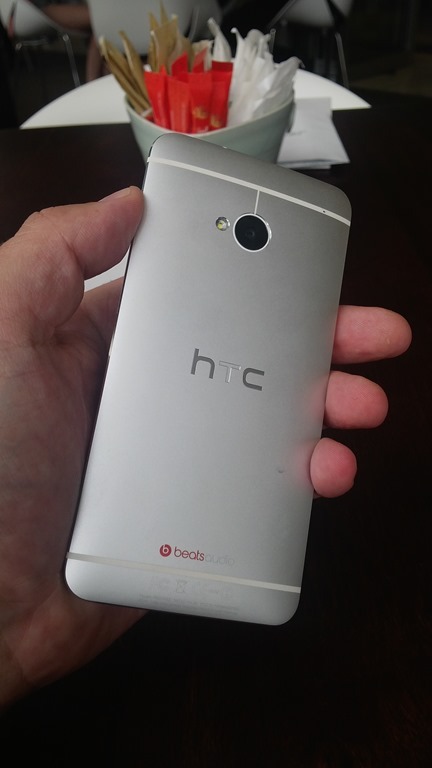 The HTC One has a build in amplifier so the quality of the sound is top notch and to make it even better is the Studio-quality sound with Beats Audio™ and the HDR Microphone. Under the settings you can switch off Beat Audio. Why you would do that I am not sure as there is such a remarkable difference to the sound quality when you do that. Add the Beat Headphone and this is a serious portable music device. It also handles and displays different languages of MP3 with no problem. A slight tap on the volume up and the HTC One comes to life and shakes the room. Even at full volume the sound is crystal clear and throw some gaming ontop of that and those sounds come to life using the dual-channels on the speakers. HTC did a fantastic job here ! HTC UltraPixel Camera which is has been designed not to have more megapixels but rather has the ability to capture 300% more light than most leading 13 megapixel cameras. This makes the images clearer, sharper and reduces the noise factor. There is a front facing camera 2.1 MP with a wide angle lens (so your face doesn’t engulf the entire picture) and has HDR capability. When you take a pic, you have lots of options to play with. You can add special effects right at the time of taking the pics, you can set the scene and adjust quality and many other settings right from the camera screen. The HTC One works especially well in low light conditions such as night clubs (they still call them that right ?). This is perfect for those evenings out when you HAVE to capture those “what was he thinking” magic moments that should not have been captured in the first place. If you take a pic in Zoe mode, the HTC One captures up 20 photos and creates a 3-second video clip. This includes sound too. The idea behind this is that when you capture an image, you are capturing a moment in time which naturally includes sound too. It works remarkably well and I must say when you look at your Gallery of images, it is great to see some of those images “come alive” and when you click on them and hear the sound too, you are transported back to the moment when you took that image. Simple things like hearing your kids laugh or reading a school story will be priceless in years to come. There are lots of powerful editing features on the phone that allow you to remove object from the screen, allow for various slow-motion effects and many many others. Thanks to the HTC One’s Qualcomm® Snapdragon™ 600, quad-corre, 1.7 GHz processor, you can really spend time editing your images directly on the phone without any lag. The only problem I have is once again in the automatic way that the HTC One brings images together. When I open the Gallery expecting to find just the photos I took, I see various images from my Social Networks. One the plus side the gallery of your photos is neatly laid out and images are easy to find, separated by date order. Using the default web browser was perfect. It handles HTML5 superbly well and scores a very decent 430 out of 500 on the HTML5Test.com barometer (BlackBerry Z10 scores 485, iOS 6 scores 386, Galaxy S3 scores 380). It has a quick “Desktop View” option so if you happen to see a website that forces you into Mobi Mode you can tell it to send you the full desktop version of the site. The HTC One is stunning phone running Android™ with HTC Sense™. There were some confusing screens but once I worked out how HTC Sense work, the phone was a pleasure to use. The HTC One is fast – apps just open and close instantly with no lag. Using Vellamo benchmarking software, the HTC One achieves the highest score beating many of the other handsets. I am not mad about the keyboard but as it is Android based you can easily swap it out for SwiftKey. It comes with 32gb and 64gb version but its always nice to be able to expend the storage – but that could just be me. Not sure how I feel about the non-removable battery. One the one hand I got a full day battery life out of it but on the other hand I know that I can’t have a spare battery for those “just in case” moment or when I am away on an all day conferences. Overall the HTC One is a great phone. If you are into taking some amazing photos, want to listed to crystal clear music and have an fantastic looking phone – this is the ONLY device for you.